A nutritional evaluation of an Irish dairy herd indicated gross overfeeding of late lactation cows, over-conditioning of cows at parturition and a high rate of body condition loss in early lactation. Metabolisable-energy based nutritional modelling software was used to guide recommended dietary changes to prevent excessive condition gain in late lactation. Immediately following the implementation of the changes there was an unexpected reduction in performance affecting both milk yield and protein concentration. An investigation into the poor performance revealed underestimation of peak milk yield; over-estimation of maize silage quality; a large difference in the concentrate being fed compared to the concentrate recommended, and failure of the blend of concentrate ingredients to maintain the intended proportions in the in-parlour feeding system. The estimated maximum cumulative effect of these errors was to cause undersupply of energy and protein in the recommended diet of 16% and 3% respectively to cows in early lactation. Use of a net-energy nutritional model would have indicated a requirement for a higher energy supply in this case. This report highlights the challenges in obtaining accurate on-farm data for use in dairy cow nutritional models. Nutritional management of the dairy cow has significant influence on health, production and reproduction particularly around parturition and early lactation [9, 7]. Monitoring nutritional status of the transition cow involves an assessment of nutritional inputs, body condition score changes, milk production performance, the incidence of production diseases, and blood parameters for mineral status and energy balance. A holistic preventative approach incorporating these elements has been outlined previously . Using this approach, if shortfalls (differences between farm targets and performance) in cow health or production are identified, an investigation into feeding management and dietary composition is indicated to assess nutritional status in greater detail. Several nutritional modelling software packages are available to aid advisors in designing appropriate diets for specific performance criteria [1, 8]. The accuracy of predictions made by such programmes depends on how accurately data entered by the advisor reflects the on-farm situation. There are a large number of on-farm variables that make accurate dietary evaluation and formulation challenging. This report describes an investigation into nutritional management of transition cows on an Irish dairy farm and an unexpected reduction in production performance following dietary alteration. A visit was conducted to an 80-cow dairy herd on January 29, 2010 to initiate nutritional monitoring. The 2009-2010 calving pattern and lactation status of each cow on the day of the visit is shown in Figure 1. Lactating cows (n = 56) were housed together and fed a single total mixed ration (TMR) ad-libitum plus home blended concentrates in-parlour at two rates for early (n = 26; average days in milk 44; range 3 - 110) and late lactation (n = 30; average days in milk 318; range 150 - 704) cows respectively. Dry cows (n = 20) were housed separately and fed a separate TMR. Details of all diets were gathered from farmer interview and farm records (Table 1). The 2009/2010 calving pattern of the dairy farm investigated and corresponding feed group by stage of lactation (early, late or dry) as on the 29th of January 2010. 1Body weight of all cows was evaluated at 650 kg.2All milk production was evaluated at 3.20% protein and 4.00% fat. 3Percent of requirements supplied. Late lactation cows were dried off approximately 60 days before their due to calve date. All diets had remained unchanged since housing on November 15, 2009. Therefore, the late lactation group of cows had been fed the late lactation diet for 74 days on the 29th of January. The dry cow group had been fed the late lactation diet for between 15 and 73 days and the dry cow diet for between one and 34 days. The early lactation cows had been fed the early lactation diet from between three and 73 days. Analyses of the first- and second-cut grass silage were available but no maize silage analysis had been performed and therefore these feed values were estimated (Table 2). Computer assessment of diet suitability was performed using the metabolisable energy (ME) and metabolisable protein (MP) modules of a nutritional modelling software package (RumNut V5.1a, Shedfield, Southampton, United Kingdom) (Table 3). All nutrient values of concentrate feedstuffs were taken from the same software package. Following discussion with the farmer early and late lactation cows were estimated to have an average daily yield of 32 L and 16 L respectively. For the purposes of the audit a target milk composition of 3.20% protein and 4.00% fat was used and all cows were assumed to weigh 650 kg. The body condition score (BCS) of all of the lactating and dry cows was evaluated using a five-point scale  and compared to published targets . Farmer records of BCS at calving were used to assess condition loss in early lactation cows. Feed values of silages and concentrate blends used on an Irish dairy farm during investigation of poor production performance. *DM = Dry matter; ME = Metabolisable energy; FME = Fermentable metabolisable energy; CP = Crude Protein; NE = Net energy; PDIE = Protein digestible in the small intestine when rumen energy is the limiting factor; PDIN = Protein digestible in the small intestine when rumen nitrogen is limiting **See table 5 for components of Blend 1, 2 and 3. NA = Not available. Requirement and supply of energy and protein for different feed groups and diets either as calculated at a nutritional audit on the 29th of January (Metabolisable Energy and Protein) or as calculated during subsequent investigation of poor performance (Net Energy/Protein Digestible in the Small Intestine) on an Irish dairy farm. The metabolisable energy based software model indicated that the milking cow diets were providing 129% and 155% of energy requirements to early and late lactation animals respectively and that the dry cow diet was providing 93% of energy requirements (Table 1 and Table 3). Also, the early lactation cow diet was being provided at 115% of appetite (feed consumption as a proportion of maximum voluntary daily intake capacity). These results indicated that it would be unlikely that the milking cows could consume this diet in a 24-hour period. This was supported by farmer observations that the milking cow TMR (fed to both early and late lactation cows as a single group) was never finished within 24 hours. Analysis of the BCS results indicated that four of 14 late lactation cows and nine of 23 dry cows were above target and that five of seven recently calved cows (24-77 days calved) had lost half a unit of BCS. The farmer observed that over conditioned dry cows had gained condition primarily in late lactation rather than during the dry period which was consistent with the findings of the diet analysis. The late lactation cow diet was found to supply up to 81MJ of excess energy daily (155% of requirement). This could support 2 kg of body weight gain per day  and a gain of a single unit of body condition within 23 days. Although not every late lactation cow would gain condition this quickly (depending on variations in voluntary intake and milk yield) significant increase in condition when consuming this diet was considered very likely. In summary, there was evidence to support excessive condition gain in late lactation cows driven by over-supply of required energy. This excess condition was being carried through the dry period and exacerbating subsequent negative energy balance and condition loss post calving. The negative health, productive and reproductive consequences of excess body condition loss at calving are well accepted [9, 7]. The milking cow diets were therefore adjusted with the aim of preventing excessive body condition gain in the remaining late lactation cows by reducing the energy content to match the calculated requirements. As a single TMR was fed to early and late lactation groups both milking cow diets had to be adjusted, with a new in parlour concentrate blend recommended. The new diets were indicated by the same software model to provide 99.6% and 101.0% of energy requirement respectively (Tables 1 and 3). As no excess energy supply was found in the dry cow group this diet remained unchanged other than to recommend that dry cows within two weeks of calving be allowed ad-libitum access to a TMR with increased maize silage. This was to provide a higher energy diet when dry matter intake was likely to reduce pre-calving, to allow a period for rumen conditioning to a higher energy diet and to account for an increased energy requirement in this group (Table 3). Finally, it was advised that all over conditioned cows be given 250 ml propylene glycol per os for seven days pre and post calving to reduce negative energy balance immediately post-calving. Events following initial recommended actions The agreed recommendations were implemented on January 30. Over the next five days the farmer observed reduced yields in early and late lactation groups. The average reduction was approximately 0.9 L per cow per day (Figure 2). The milk composition was adversely affected over the same period with protein percentage in the bulk tank reducing from 3.24% on January 29 to 2.96% on February 4 (Figure 2). 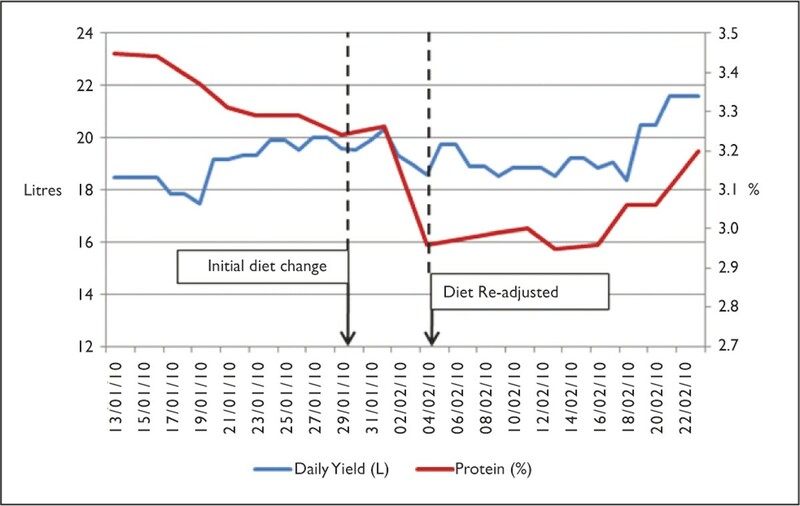 Average milk yield per cow per day and bulk tank milk protein percentage changes following dietary alterations on an Irish dairy farm. An investigation was initiated to identify possible causes for the unexpected reduced performance. The investigation focused on the following key areas: data in-putting errors in dietary computations; errors in dietary factual information collected from the farmer interview; errors in cow production estimations; errors arising from the assumptions of the quality of dietary components and differences in the diets recommended compared to those actually fed. Whenever possible the percentage difference in required energy and protein supplied to cows in early lactation compared to the previously advised diet was reported to quantify the effect of each inaccuracy identified. No data typing input errors were identified from the original assessment. The accuracy of the estimated 32 L daily milk yield of early lactation cows was assessed by two methods. The herd average 305 day milk yield was calculated from all milk recording data from the previous 12 months (n = 7) and average peak yield was estimated by division of the 305 day yield by 190 . 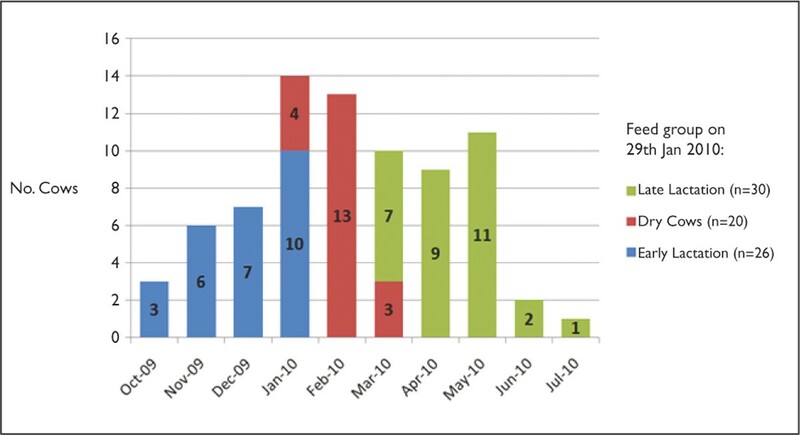 In addition, the range and mean of early lactation cow milk yields (1-70 days in milk) were reviewed from available spring 2009 milk recordings. The average recorded 305 day milk yield from the previous 12 months was 6,850 L giving a predicted average peak yield of 36 L . Milk recordings were available from January and April 2009 and indicated average yields of 30 and 35 L respectively and a range of early lactation yields from 15-48 L. Thus an early lactation yield of 35 L was selected as a likely possible yield. The increased energy and protein requirement resulting from the inaccurately assumed milk yield amounted to 6.4% and 7.1% respectively (Table 4). A representative 5 kg sample of maize silage was collected from the farm and placed in a sealed plastic bag and submitted for laboratory evaluation of nutrient composition (Oldcastle Labs, Cogan St, Oldcastle, Co. Meath). The results from laboratory analysis of the maize silage indicated very low dry matter (22.7%), starch (16.9%) and ME (10.6 MJ/Kg) values (Table 2). These values were lower than the estimated values originally used and reduced the supply of energy and protein in the diet by 8.0% and 4.0% respectively (Table 4). No differences were identified in the composition of the milking cow TMR being used on the farm compared to that entered into the original computer model however the in-parlour feed being used on farm differed from the one advised (Table 2 and 5). The effect of the different in-parlour feed used was to reduce the supply of energy and protein by 2.0% and 9.9% respectively (Table 4). Calibration of the in-parlour feeding system was checked by an independent milking machine technician to ensure that the correct weight of concentrate feed was being dispensed. Separation of blended concentrate feeds when fed in-parlour was assessed by collecting a representative 1 kg sample 'as-fed' into a sealed plastic bag. This was submitted for laboratory evaluation of nutrient composition (Oldcastle Labs, Cogan St, Oldcastle, Co. Meath). Results were compared with the predicted values for that blend obtained from an Irish feed database . The in parlour feeding system was found to be accurately calibrated with each feeder dispensing the appropriate weight of feed. However, there were gross differences between the results of laboratory analysis for the blended concentrate feed collected in the parlour and the calculated figures from the feed database (Table 6). Separation of the dry concentrate feeds was taken to be the most likely cause of the gross differences observed. Composition of dry blended concentrate feeds fed in parlour as predicted by a computer software package and as analysed in a laboratory during investigation of poor production performance on an Irish dairy farm. Results from the ME based model were compared to results from a net energy (NE) computer software package (INRAtion-PrevAlim v3.3 2006). Net energy nutrient values were obtained for the grass silages (Agri-food and Biosciences Institute, Newforge Lane, Belfast) and for the concentrate feed . The NE model indicated that the advised diet was deficient in its supply of energy by 12% (Table 3). Results from this investigation revealed several inaccuracies existed in the data collected for use in nutritional modelling software used to direct the initial nutritional changes. Errors in evaluation of average daily milk yield, maize silage quality and concentrates fed in the parlour were estimated to reduce required energy and protein supply by 15.4% and 21.0% respectively compared to the advised diet. These inaccuracies meant that the diet used may only have supplied 84% of required energy and 97% of required protein to cows in early lactation (using the metabolisable energy/protein system). Only some of the results of this investigation were used to inform alterations during the period of poor performance as there was a significant time-lag in receiving laboratory results. 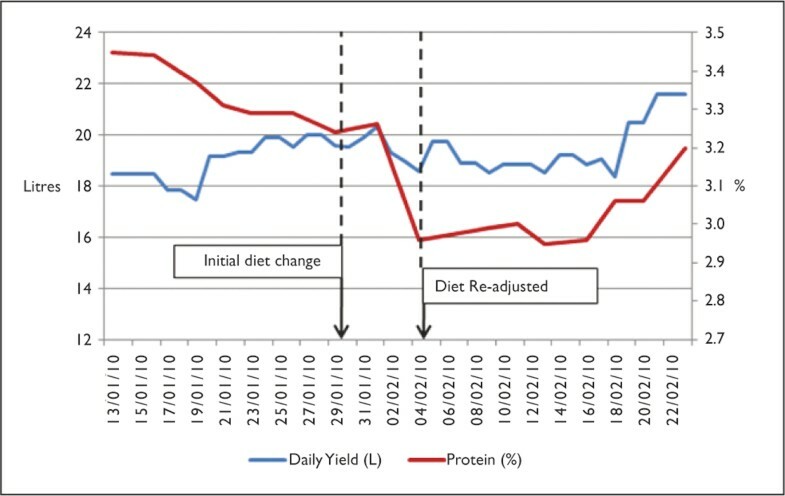 The diet was re-adjusted following the reduced production to increase energy content with poor maize silage quality suspected. The milk yields and composition improved slowly over a period of several weeks during and after the investigation (Figure 1). In this case there were several challenges in obtaining accurate data to assess nutritional requirements and dietary supply on a commercial dairy herd. It is the authors experience that underestimation of average milk yield occurs commonly in dairy herds. If available, milk recording data should be used to validate estimated yields for the purposes of dietary evaluation. It should be noted that feeding cows with a range in daily yields from 15 L to 48 L as a single group will always risk under/over-feeding cows at either end of the spectrum. Failing to have ensiled feeds analysed for nutrient content and altering concentrate feeds according to availability and cost is also common practice amongst dairy farmers. The maize silage in this case had been visually inspected and did not appear to be of poor quality. It is the authors' opinion that estimating silage quality in this way introduces an uncontrolled risk into nutritional assessment. The difference between the advised concentrate blend and the one actually fed resulted from substitution of constituents by the farmer when some of the advised constituents were not available (Table 5). The cumulative effect of all these factors contributed significantly to the reduced performance in this case. Some degree of difference between the analysis of the dry blended concentrate feeds 'as fed' and the calculated figures from standard texts was expected. However the magnitude of the difference observed is considered only possible if settling out of component feeds was occurring in the in-parlour feeding system. This would have the effect of inconsistent supply of nutrients to the cow. Feeding dry blended concentrates reduces costs but when settling out occurs it may increase the risk of negative energy balance, ruminal acidosis and mineral deficiencies in individual animals. The results of this investigation indicated that there was a sudden reduction of energy content of the early lactation cow ration to approximately 16% below requirement. The observed consequences were reduction in volume and protein content of the milk produced. The sudden dietary change described is likely to have reduced both the yield of microbial protein and volatile fatty acids from the rumen  with subsequent effects on milk production. Insulin and insulin-like growth factor are hormonal regulators of milk protein production and are known to reduce within hours of energy restriction in lactating dairy animals [2, 5]. Changes in protein composition of over 0.3% have been observed within four days of changes in circulating insulin . The rate and extent of the protein alteration described in this case (approximately 0.28% within five days) were therefore considered as plausible consequences to the marked energy restriction caused by the dietary change. When the NE system was used to evaluate the advised diet in this case it indicated an important energy deficit in the advised diets. The NE system used in this case accounts for losses in energy from associative effects and therefore is more generous to the cow by assuming greater actual energy requirements. Had this NE system been used at the initial visit it would have offset some of the deficits in energy caused by the errors discussed above. Differences between dairy cow nutritional models have been presented previously . The results of this investigation highlight several areas where error can occur when estimating data for entry into nutritional modelling software packages. In this case, for each error identified the effect was to either overestimate feedstuff nutrient values or underestimate cow requirements. The cumulative effects of these errors ultimately caused under-feeding of the dairy herd that was likely to be sufficient to cause the observed reduction in performance. The authors would like to acknowledge the farm owner for assistance during this investigation.